Posted on December 26, 2017 , in Hot Tubs. If you are considering purchasing a hot tub it can be a very exciting time. However, the choices can quickly become overwhelming when considering all the styles and options available. Below we have compiled a list of information you should know to help you make the most informed decision. Chances are if you are buying a hot tub you are looking to make a significant investment in your health and your home. You want something that will last for years to come and be easy to maintain. New hot tub owners often default to the easy entry-level or budget models due to the price tag. But you get what you pay for and often times these models lack important features, break down often and require expensive repairs. Below is a checklist of some features you will seriously want to consider when searching for a hot tub. When it comes to materials some favorites are stainless steel, thermal plastic, and thick wood. These materials are sturdy and can handle harsh weather conditions. Materials like inflatable tubs or soft-sided vinyl deteriorate and are often flimsy. To make your maintenance a lot simpler consider a self-cleaning model. These models are equipped with specialized water filters which reduce the amount of time you need to put in to keep your pool clean. These tubs also require fewer chemicals. Heat loss can be terrible for your utility bills and be difficult to maintain. One way to avoid this is making sure your hot tub comes with sufficient insulation. Models with full-foam insulation are best, while basic and partial insulation should be avoided. A common concern among new hot tub owners is their utility bill. High bills can easily be avoided when selecting energy-efficient models or CEC certified models. These designs trap and reuse waste heat to minimize the energy consumed. Hot tubs with customizable massage jets are highly desired because of their therapeutic massage programs. These programs allow many users to benefit by treating their pains or headaches for example. When you invest in a quality hot tub cover that is durable, well sealed and lockable, you are preventing heat loss and any debris from entering or damaging the unit. Before you purchase a hot tub confirm the warranty. This is a big investment so peace of mind can go a long way should anything go wrong. 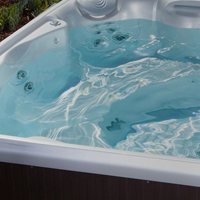 The quality hot tubs will provide a comprehensive warranty that will cover all structure, shell, parts, and repair costs. Once you have thought about what features will provide you with the best experience, decide on where you want to install your hot tub. You can install it indoors or outdoors, it is all really dependent on your lifestyle and preference. Outdoors provide the opportunity to add beautiful landscaping, social opportunities and creating a new focal point in your home. Some prefer indoors for the privacy and consistent availability it offers year round. Before you settle for a location you should also consider the space available. Think about what size hot tub you want and who will be using it. Will it be for parties and get-togethers? Will it be used by children or larger adults? You want to provide enough space so users can comfortably relax and move around. Now that we have covered everything you should know when deciding what hot tub is right for you it is time to start searching. To get started on browsing models, download a hot tub buyer’s guide.